Creating the Energy for Change - The Jackie Sherman Group, Inc.
Like many leaders, you may get ahead of your organization when leading change. You see what needs to change because it’s part of your role. However, to lead change successfully, it is critical for you to create an opportunity for others to see what you see … and for you to understand what they see. I often hear about this type of situation – someone proposes a solution and becomes frustrated when others are not enthusiastically signing up to follow them and implement the proposed change. As a leader you are always leading change. Your work is to lead your organization from the present into the future … a future that is better than the present. Whether that change is a slow steady progression or requires a significant shift, to be successful you need to generate the energy for the change to be successful. How effective are you at managing change? Do your efforts feel hit or miss? How well do you understand the key factors that lead to successful change? In this article you will learn a simple yet powerful framework that describes the conditions necessary for change to occur. You can use it to design a change process that flows well from the beginning or to help you understand why a particular change effort is stuck and how to get it moving. Successful change requires dissatisfaction with the status quo (D), a positive vision for the future (V), and practical first steps (F) to get started. If any of these are missing there will not be enough energy to overcome whatever resistance exists … and there is always resistance. 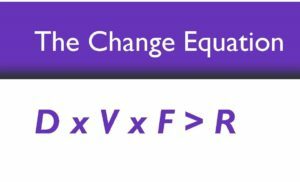 For change to occur the three variables on the left of the equation are multiplied together. So dissatisfaction, vision, and first steps must all exist (be greater than zero) for the left side to be greater than the resistance, the energy pushing against the change. Ignoring any of them will cause your change to get stuck, take longer, cost more, or fail. Dissatisfaction (D) with the current state is what pushes or propels a change – it creates motivation. Without dissatisfaction, there is not enough energy for a change process to begin. Dissatisfaction can be directed at something specific in the current situation, or with the current level of results. No matter how clear the vision and first steps, without dissatisfaction there is no “reason” to change, so you stay stuck. Vision for the future (V) is the force that pulls the change – it provides direction. It is the positive possibility for the future. Vision must be a compelling description of what you want in the future, not simply the absence of something in the present. Vision needs to be enough of a stretch from what exists today to make it worth an effort to get there, and yet seem achievable. When you have dissatisfaction and first steps, but no vision for the future you create an experience of “change of the month” – trying lots of things, but nothing “sticks” because there is no clear direction. First Steps (F) are actions you can take to begin the move from the present toward the desired future – a path forward. Clarity about some first steps creates a sense of capability and hope. When you have dissatisfaction and a positive vision for the future, but don’t know what the steps are to get started, you get frustrated and stay stuck. You must have a path forward in order to feel you can get started. Resistance (R) is a force that slows or stops movement. It represents the risks and barriers to the change – the perceived cost of change. It is normal and natural to encounter resistance – some resistance always exists – it’s part of our biology. Some risks and barriers cannot be changed and others can be influenced to change. The good news is that you can influence each of these 4 variables. You increase the energy for a specific change by raising the variables on the left-hand side (D, V and F), and / or decreasing the variable on the right-hand side (R). This framework works for any intentional change – organizational or personal. Applying the framework for change involving only one person is simpler because there is only one person’s D, V, F and R to consider. Organizational change is more complex because of the greater number of stakeholders involved. As a leader you know that just because you want something to change doesn’t mean that it will. And telling people that you want them to change is also not enough. A critical mass of those with a stake in the both the present and the future must be dissatisfied with the status quo, share a vision for a better future, and be committed to first steps in order for change to get started. You may be surprised to learn that in a large organization only 20-30% of stakeholders is enough to reach a critical mass. This is because collective energy is more powerful than individual energy. To create collective energy, the dissatisfaction must be known, the vision for the future must be shared, and the first steps must be owned by the group but also feel doable. I’ve found that leaders are often reluctant to surface dissatisfaction for fear it will turn into a gripe session, get out of hand, or require each individual’s issues to be addressed. While I understand these concerns, there is no chance for the energy for change to build unless people know that others are also dissatisfied. Unless there is strong enough commonly known dissatisfaction, little or no change will take place. When you find yourself having to “sell” the need to change or feel like you can’t get your organization on-board, there’s a good chance that enough people aren’t dissatisfied. This is a sign to engage them to discover or surface their dissatisfaction. The leader being dissatisfied is not sufficient. A positive, compelling, and shared vision of the future serves as a beacon through the change process. Although the details may shift, the overall picture should be consistent over time. The more clear, detailed, understandable, positive, and tangible the vision, the stronger the force will be that pulls people toward the change. Organizations having dissatisfaction and first steps, but no clear vision experience the “flavor of the month” syndrome– a continuous stream of new initiatives with no permanent results. People may participate in the initiatives, but they don’t know why. As a result, the initiatives eventually die and you get no real change. Although initiatives are actually “first steps” – a way to get somewhere – they are not themselves a vision for a better future. The power of first steps increases when those steps are clear and within the organization’s capacity. They don’t have to be large or many, but they must be known, clear, and within the capacity of a critical mass of the organization. If first steps are not clear, or out of reach of the organization, frustration and eventually passivity or helplessness sets in. Resistance to change in organizations can take many forms, e.g. denial, confusion, criticism, easy agreement, sabotage. It’s common to try to overcome resistance by pushing back, but that usually has the opposite effect – increasing resistance. It’s more effective to manage resistance by understanding it and using that information to adjust your approach and build support for the change. Let’s revisit John’s situation through the lens of this framework. Clearly, he was dissatisfied. He had a vision for better results and the first steps (a new strategy) to get there. The leadership team however was not (yet) dissatisfied, and didn’t share his vision … so, of course, they weren’t signing up for his strategy. Once we created an opportunity for the leadership team to assess the company’s existing strategy and the results it would likely produce, the team quickly convinced itself that the strategy would not achieve their desired results. Creating a vision and getting clear on some first steps flowed easily once they all had a reason to want something different. It’s not unusual for a senior leader, who has been thinking deeply about his/her organization’s situation, to become dissatisfied with the current state of the business, have a vision for “better,” and visualize an idea of how to get started. The leader has energy for change, but until others are dissatisfied, have a shared vision, and are clear about how to get started in that direction there is no collective energy for change. This same dynamic is often replicated between the leadership team and the layers of the organization below them. When John and his leadership team were ready to share their new strategy with a larger group of leaders they designed a meeting that allowed the top 120 managers to assess for themselves the competitive environment and the probability that they would succeed with their existing strategy. It didn’t take long before the group was dissatisfied and became interested in a vision for improvement with a plan for getting there. The leadership team shared the vision and the new strategy and were able to engage the next level of leaders to determine how to implement the strategy throughout the organization – thus further building the energy for change. Neither Yours, nor Mine … but Ours: Another client, a University Library, came to me after several unsuccessful attempts to implement organization-wide change. Both the library leaders and the staff were dissatisfied with the current state of communication and decision-making, but for very different reasons. The future vision that the employees had did not address the dissatisfaction of the leaders, and vice versa – and the compromise version they had developed was so complicated that it didn’t work for anyone. They were stuck. Although they were all dissatisfied, they did not have a shared vision. Only after creating a vision that addressed the concerns of both groups were they finally able to move forward and implement how the library would operate. Merged Businesses … A New Leader … A Team that Leads: Karen was appointed SVP for a new business unit formed from two existing businesses, each with its own structure and culture. She wanted to form an effective team to lead the business. In this situation the “dissatisfaction” (motivation) came from merging the two businesses into one and the desire to have a clear role for the newly formed leadership team in additional to clear roles for individual team members. Both Karen and her team members were concerned about these issues. They also agreed that the “vision for better” was a unified team with a common purpose, clear roles and responsibilities, and commitments to each other. As “first steps” for leading the business to achieve its stretch goals, the team members fleshed these out; further steps involved implementing them, monitoring progress and adjusting as needed. Unlike the previous two examples where the change process was stuck, for this intervention we used the framework to design success from the outset. Dissatisfaction represents reasons for change from the perspective of the different stakeholders. Rather than coming from a “problem”, in this situation it came from something external … moving from two businesses to one … with a new leadership team and a new leader. Dissatisfaction does not have to come from something strongly negative … just from a need or desire for something different than “what is” or “what was”. While many leaders try to tell their organization why change is needed, it’s more effective to create an opportunity for self-assessment. With good information and a good process, people usually convince themselves there is a need for change and they are more likely to move toward something they have concluded for themselves. It’s much easier to develop a vision and first steps if the people are already convinced that a better future is needed. Use the framework of D x V x F > R to design your change process from the outset, or to diagnose what might be preventing a change from getting off the ground or taking hold. When you begin to design a change process, be sure to determine how to establish the need for change (D), what the preferred future is (V), what the first steps will be (F), and what resistance (R) exists. How will you engage the stakeholders at each level of the change to understand and address each of these key factors? If you are in the middle of a change process that seems to be stuck, this framework can help you determine why, and what to do to get it moving. Consider each of the variables. Have you made them explicit? If not, engage people in a conversation or process which allows them to clarify the dissatisfaction, vision, and first steps. No one finds it easy to lead change … but it’s part of your role as a leader. Use this framework to help you pull together the organization’s energy and improve your success rate. A version of this framework was proposed by David Gleicher and first published in 1969 by Richard Beckhard. This change framework is one of the most effective ways I have found to help but individuals as well as organizations to effectively manage change. I find that clients like it because of it is simple and easy to understand although each variable is rich in meaning in terms of but diagnosing why change is not happening or has stalled out. It also provides a solid foundation on which the change process can initiated and managed. I do a lot of executive coaching and have found it to be extremely helpful to them in terms of focusing and managing own personal change efforts. Jackie is a professional colleague of mine and she graciously shared this framework with me a number of years ago. I am so grateful that she did because I have been able to use it so many individuals and organizations to make the positive changes that needed to make. A big thanks for sharing this with all the people on your contact list because I know from personal experience just how great a framework this is for leading and managing change. Thanks for sharing the ways in which this framework has been helpful to you and your clients. I too found your blog very easy to follow and now am ready to put it to use for myself personally. Rob Johnson, owner Rob R Johnson Ltd, Co.
As you continue to go through your transition you may want to review the material from William Bridges. I have it found it helpful both for organizational transitions as well as the personal transitions I’ve made over the years. The Bridges Transitions Model is easy to understand and apply. I will write a post about it in the future.